Highly bioactive source of naturally occurring multi-vitamins, minerals, carotenoids, bioflavanoids, phytosterols, amino acids, fatty acids, enzymes and more. Suggested use: For the first time, start by putting a couple of granules under the tongue for test for sensitivity. Slowly increase to 1-2 tablespoons. For best absorbency of inner nutrients, chew granules to break outer granular wall. Should you experience an allergic reaction (itching or sneezing, swelling, water eyes) avoid taking full dosage and consult with your nutritionist/practitioner. 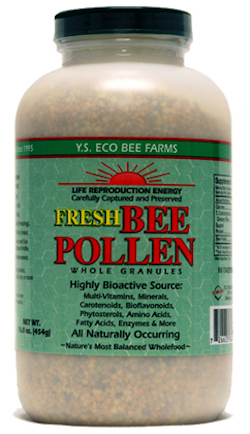 Studies have shown bee pollen may help build immunity to common allergies.